current iPhone to another phone. Not wowed by the new Apple iPhone 5S? If you’re considering moving from an Apple iPhone to a popular Android device, like the Samsung Galaxy S4, be careful: Mashable is reporting that a common glitch in moving to a new phone could cause your text messages to start disappearing into the digital ether. If you send a text message from your iPhone to another iPhone, Apple uses its own iMessage data connection for the job instead of using your phone’s cellular network. Here’s the problem, though: If you switch from an iPhone to any other non-iPhone device, your iPhone owning friends’ devices will still associate your cellular number with an iPhone by default. 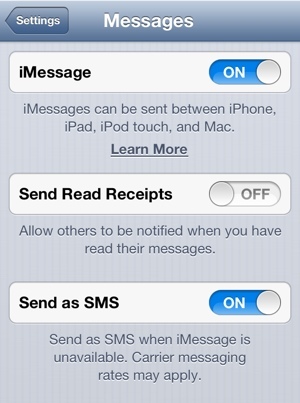 That means any text messages sent to you by another phone will be sent as an iMessage. Android phones don’t know what to do with a received iMessage, so those sent communiqués are simply trashed. Fortunately, there’s a way to keep Apple from holding onto your texts. Before you wipe, deactivate and sell your old iPhone, be sure to turn off iMessage (tap Settings, then Messages). It's the simplest, most effective way to make sure your next phone gets all the text messages sent to it. If you can’t do that for some reason – say you’re getting a new Android phone because your old iPhone fell in the drink – then there are a couple other options that might prevent iMessage from holding onto your text. First, try visiting your Apple profile page to deregister your device. If that doesn’t work, try changing your Apple ID password. You can also use iCloud.com to wipe your old phone. Any of these acts should tell Apple’s servers to reset iMessage functionality. There will be situations where even this doesn’t work, such as those where your carrier gives you a “new” phone number that previously belonged to an unknown iPhone user who never turned off iMessage. In these situations, you only have two options: Wait 30 days for Apple to automatically disassociate iMessage with that phone number, or request a different number from your carrier. Of course, you shouldn’t be required to do any of this – the burden of fixing this iMessage glitch should fall on Apple’s shoulders, not yours. However, it seems like Apple doesn’t want to invest in helping you move to Android.